How to Deal With Airplane Etiquette Offenders #Infographic ~ Visualistan '+g+"
You are a seasoned traveler. You’ve got your check-in process down to a science and know how to board quickly and efficiently. So when you walk into the cabin and find that the person in front of you has overpacked and is hogging bin space or the person next to you has opened up a pungent snack, you can’t help but cringe and brace yourself for the long flight ahead. 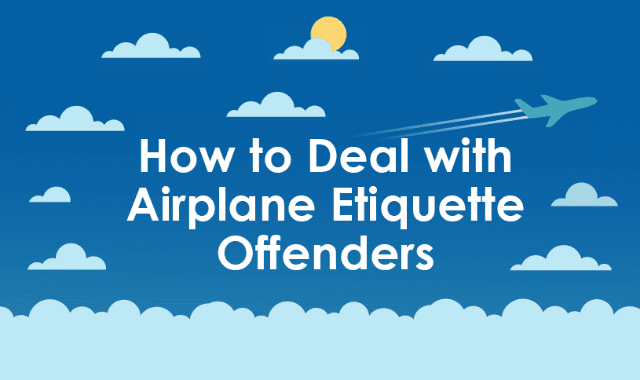 To help you manage these two troublesome passengers and a handful more, we created this visual on how to deal with the worst airplane etiquette offenders.